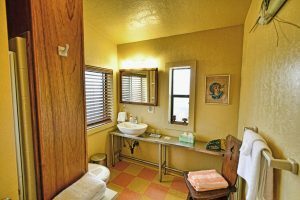 At Casa de los Desperados we are proud to offer 3 well-appointed rooms in the lodge and 2 remodeled vintage trailers – each with its own patio, outdoor entrance, and bathroom – and uniquely decorated with antique furnishings and artifacts. 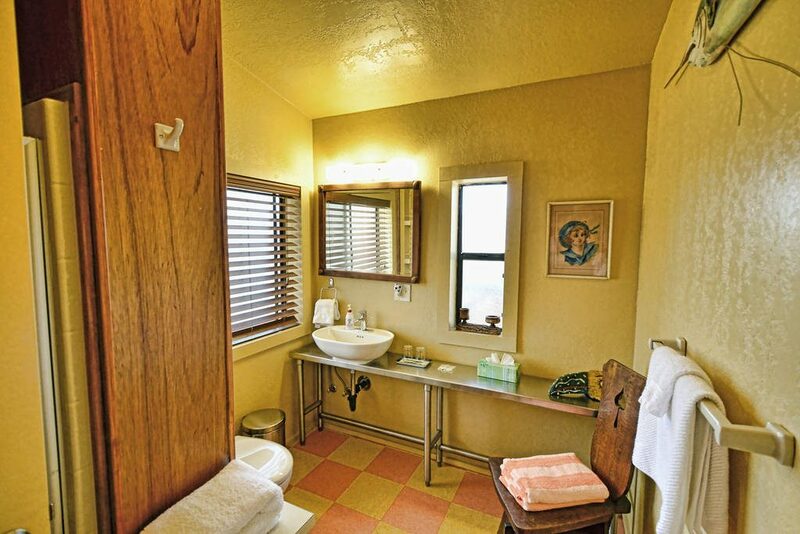 And don’t forget, a home cooked gourmet breakfast is included for every night you stay with us. Decorated in antique and lodge-style furnishings, our largest room boasts a comfy king sized bed with super soft line-dried Egyptian cotton sheets, and your own private covered patio, complete with adirondack chairs and a hot tub. 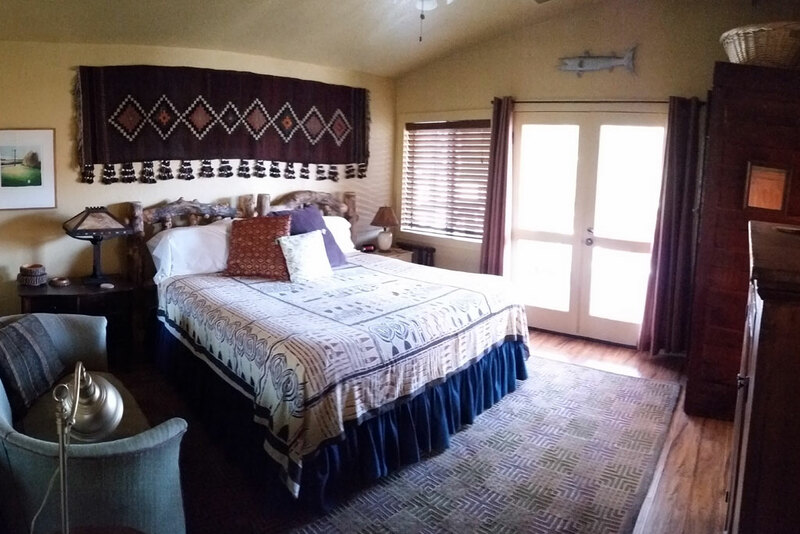 This queen room’s leopard carpet and exotic art will make you feel like you’re on Safari. 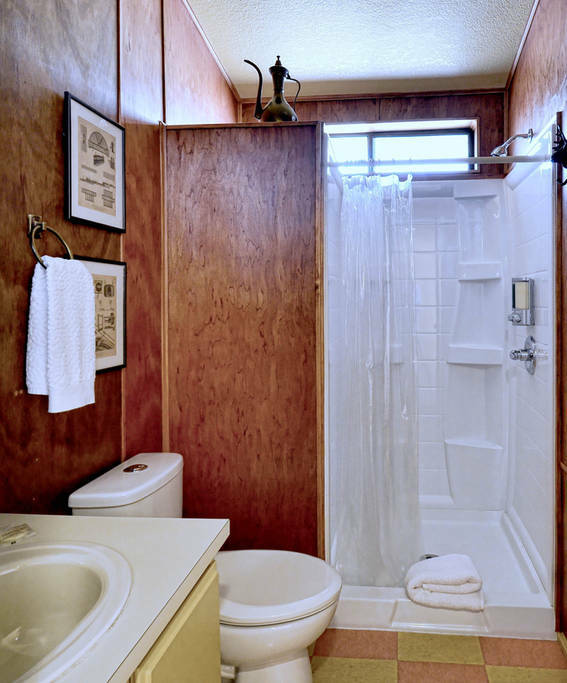 The private bathroom is paneled in mahoghany. 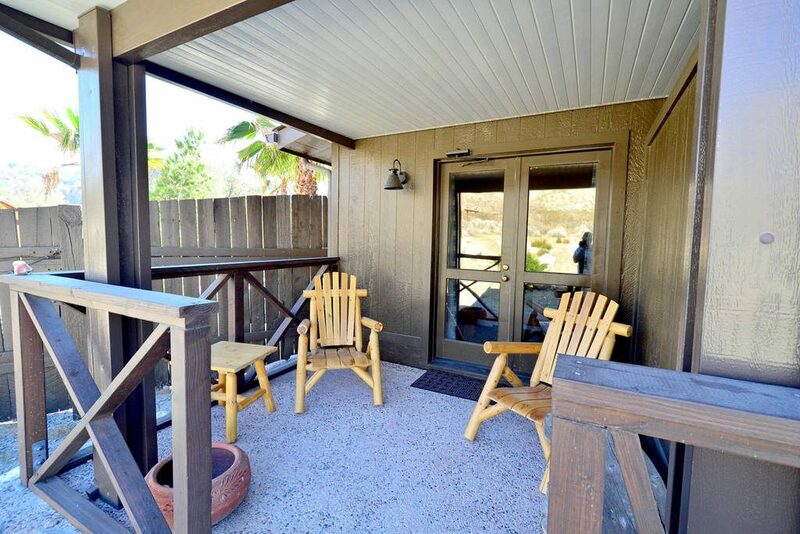 Your secluded patio is a great place for coffee or reading that book you’ve been looking forward to! 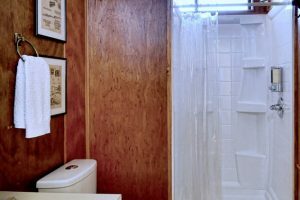 Mahogany bath, like a boat! 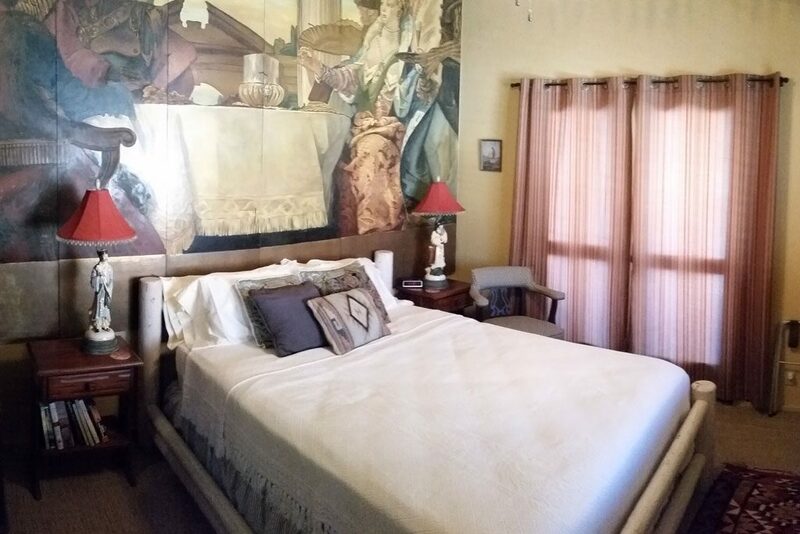 The beautiful painting that gives this room its name is a copy of a fresco in a Venetian palazzo. 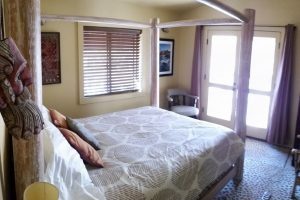 A little bit baroque, a little bit mountain lodge, this room has a queen bed and its own patio for a peaceful refuge where you can recharge and relax. This restored 1963 vintage trailer is true mid-century right down to the boomerang formica. 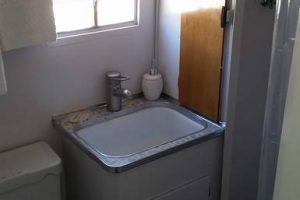 The small but complete bathroom is ingenious in design. 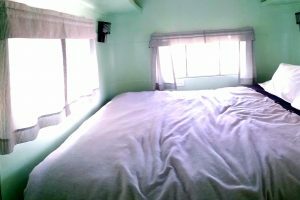 A king bed, fridge, TV, and AC are included. All the comforts of home but you don’t have to cook breakfast! 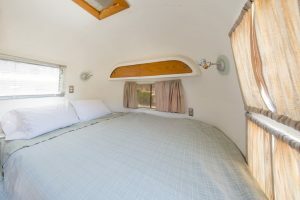 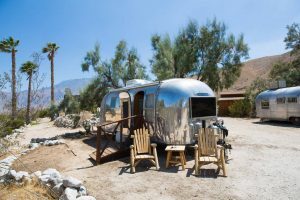 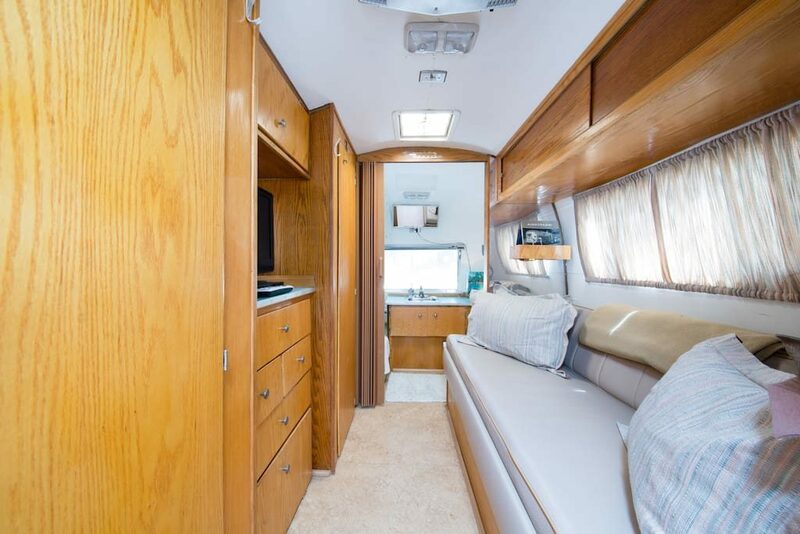 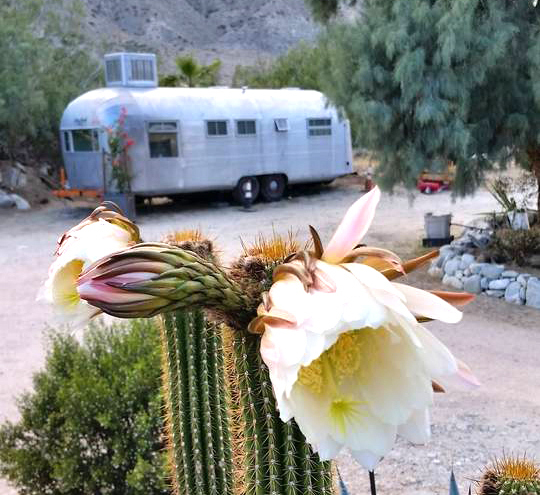 Airstream’s beautiful twin sister, this 1956 one bedroom vintage trailer has a small sitting room and a queen bed. 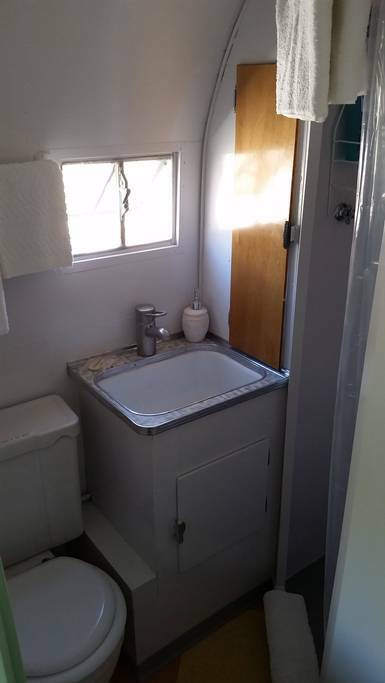 The compact bathroom features a full stand up shower. 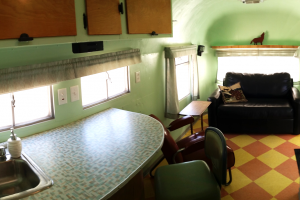 A fridge and wet bar in the 50’s style lounge area and evaporative cooling complete the throwback environment! 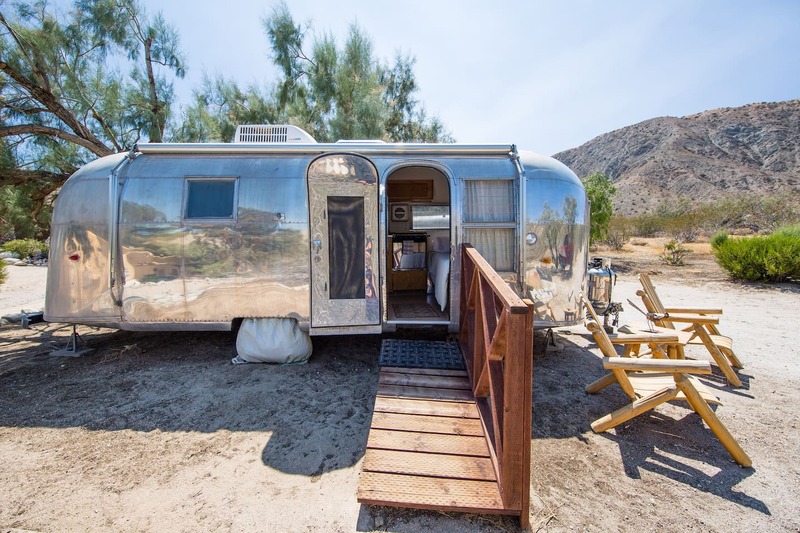 Go on a hike up the canyon wash (the dogs are sure to show you the way), visit the Whitewater Preserve, journey through Joshua Tree, and be home in time for a night on the town, or star gazing without street lights interrupting the view. 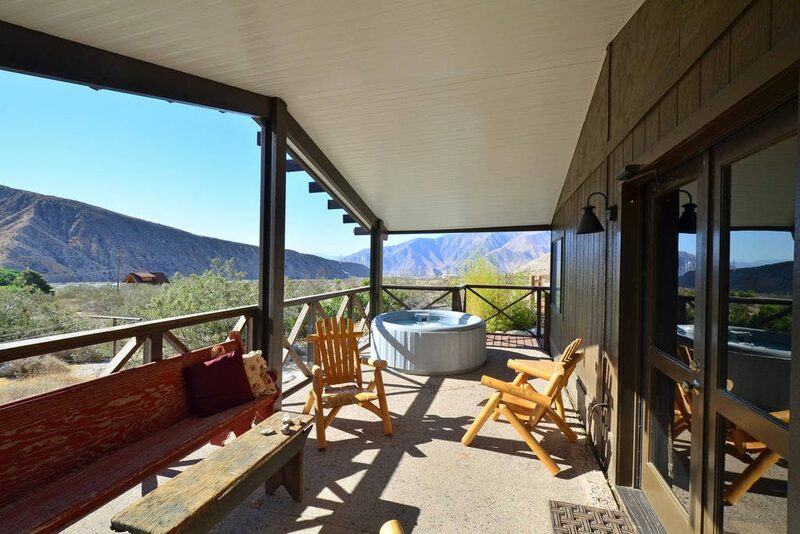 Immerse yourself in the natural beauty and charm of the desert. 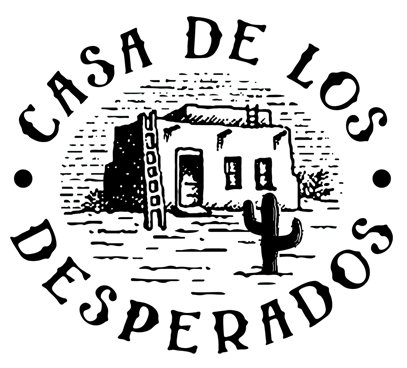 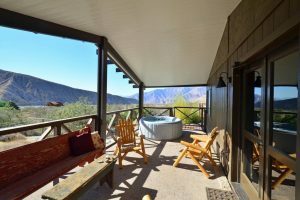 Wake up to a gourmet breakfast created by your host, Wayne King, a seasoned chef (pun intended) with creative and comforting cuisine, drawing on international flavors and farm to table inspiration. 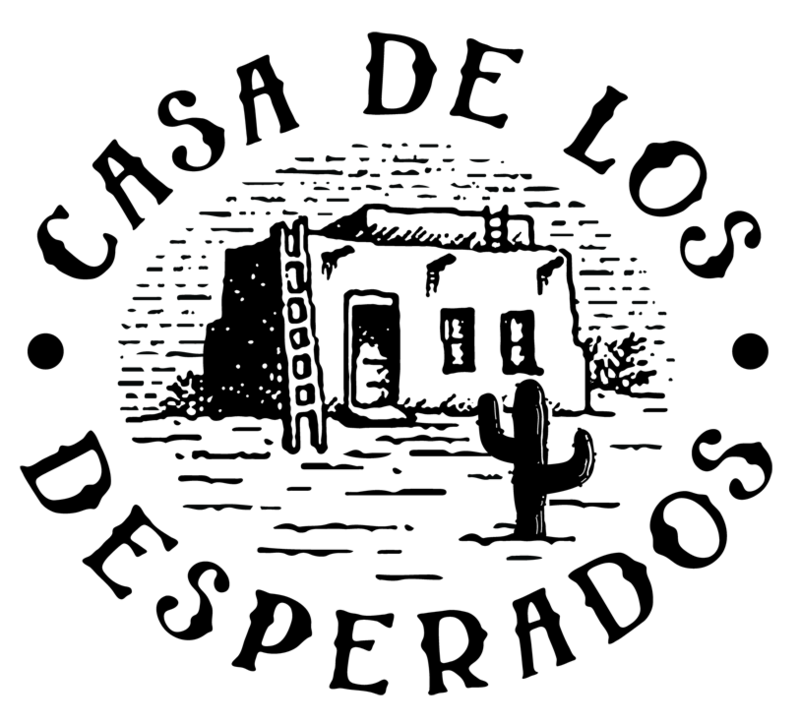 Indulge and recharge as you meet new people and exchange stories at our community style table. Our eco-friendly western ranch style bed and breakfast will transport you to a world of warmth, relaxation and delicious food. Located in the heart of Whitewater Canyon, but only 15 minutes from downtown Palm Springs, there is something for everyone. 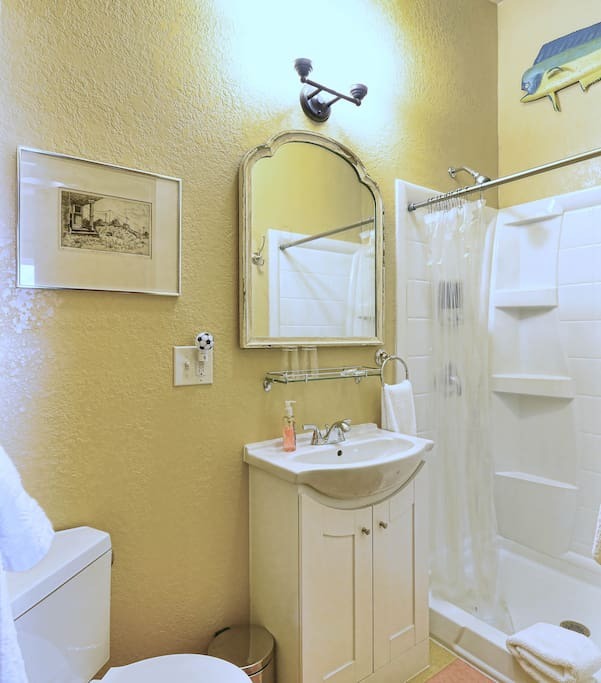 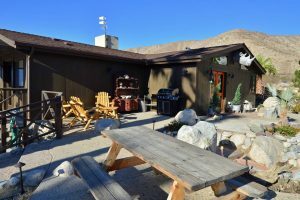 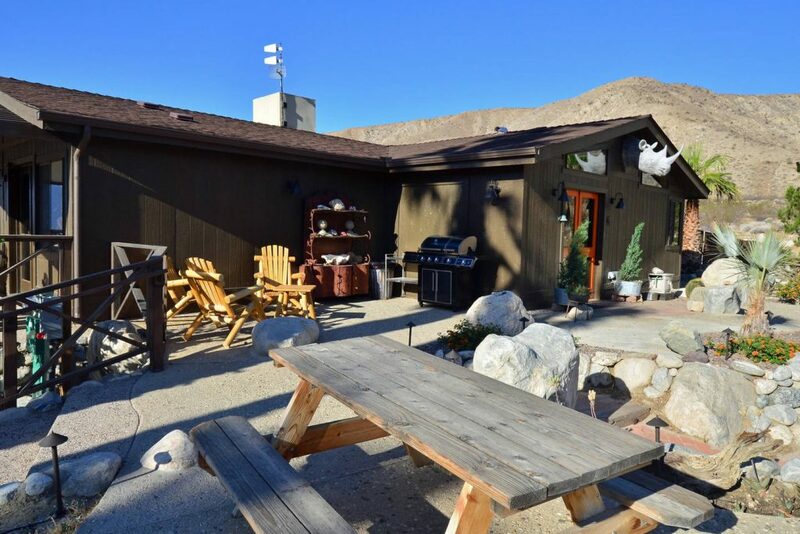 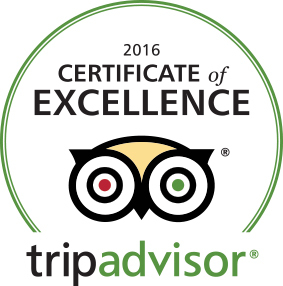 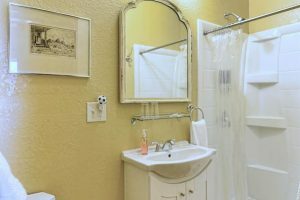 Whether you are seeking a peaceful retreat, a romantic getaway, or want a base from which to explore the natural wonders of the Coachella Valley, you will find what you are looking for at Casa de los Desperados. © 2019 Casa de los Desperados - Bed and Breakfast.